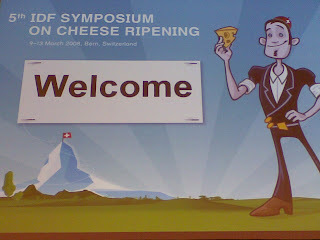 I'm just home from the 5th International Dairy Federation Symposium on Cheese Ripening held this week in Bern. Needless to say, the event ran like Swiss clockwork for the 400+ delegates and it was very nice to catch up with so many cheese friends. A lovely feature of the world of cheese research is that it is really like a large family; it is a small area and so one can so easily get to know well many scientists from around the world. In between cobbling together a grant proposal with some Irish colleagues, I managed to attend nearly all sessions quietly sitting up in the top corner soaking up the latest thoughts on cheese. 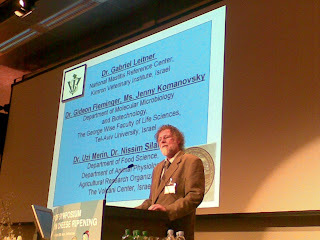 The symposium programme reflected the current themes in cheese research; we learned much about PDO varieties but perhaps there were fewer talks than before on the big industrial products, Cheddar, Mozzarella, Gouda and processed cheese. The poster sessions were very well attended and contained many interesting ideas for future work. One that stood out for me was Wim Engel's method for making micro-scale cheese in a microtitre plate developed at the NIZO; Wim easily trumped our mini-scale cheesemaking technique (20 g) by about two orders of magnitude! The symposium dinner was held in a marquee on top of the Gurten in the midst of the tail-end of the terrible storm that hit Ireland earlier in the week. Science was largely left behind that evening which was a symposium in the more classical sense of the term(!) but with Swiss folk music. Ylva Ardo of Copenhagen received a much deserved award for all her dedication and hard work through the years. I had my first introduction to Raclette, a cheese I had read about but never before tasted. It was absolutely gorgeous when melted and the organisers arranged a few hundred grammes for each conference delegate as a very welcome going-away present. All-in-all, congratulations and thanks to the local organising committee and particularly to Ueli Butikofer, Hans-Peter Bachmann and of course Johann, the quirky cartoon character who kept us all entertained with his yodelling!